Increased storage capacity of up to 50%. Flexi provides a more space efficient solution by eliminating dead aisle space required by counterbalance or reach trucks. Depending on the building, this can increase usable storage space by between 25% and 50%, making handling operations significantly more efficient and reducing the cost per pallet stored. Flexi works in aisles just 1642mm (Euro)* and 1762mm (ISO)* wide, enabling warehouse capacity to be substantially increased compared with conventional trucks. *BITA-FEM GN9 refers. Inside or out – Flexi saves all round. Flexi is equally at home working outside the warehouse in loading areas. 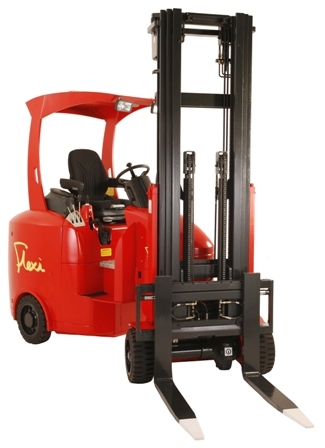 It is able to operate a complete ‘road to rack’ function, eliminating time consuming double pallet handling, plus the need, and cost, of a separate counterbalance truck outside. Flexi – A global solution to handling efficiency. Today, the Narrow Aisle articulated Flexi range is available through a global network of Authorised Distributors, who are fully supported by the company. Already established as Europe’s most popular articulated truck, Flexi is also firmly established throughout Asia and the Americas.